After watching reruns of Friends, I began to see the similarity between their lives and my own. My friends and I are trying to find jobs, or better yet careers, in today’s economy and it is not easy! We strive to become more independent from our parents (financially), pay the bills, and look for jobs. The same premise goes for the TV show, Friends, which was first aired a little less than 20 years ago! So how could this show apply to our generation? I’ll tell you! Although experts differ on the beginning birth year that classifies people as part of the Millennial Generation, most Gen Y people were born in the 1980’s or later. With this definition, the cast of Friends is not part of Gen Y. 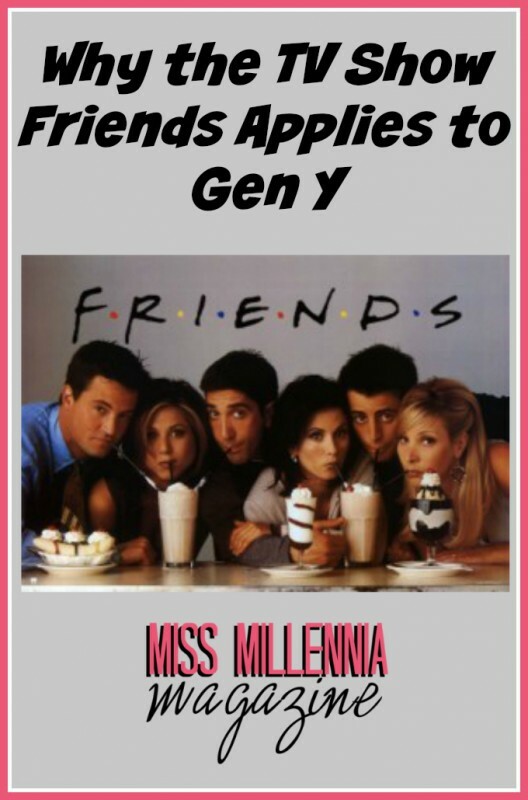 People of Gen Y more or less grew up in the 90’s, probably watching Friends without realizing how closely this TV show would resemble their lives in the coming years. Gen Y men and women grew up in a booming technological era. In the 90’s the Internet was becoming widely known and families began to buy household computers. Now the Internet abounds with social media and online videos. In the first couple of seasons of Friends (before the millennium), there is hardly any talk of the Internet and the VHS player and box-like TV look like antiques. Apart from the actual period, age differences and lack of technological presence in the show, Friends is still applicable to Gen Y. Friends features men and women in their 20’s and 30’s, struggling to find the right job and make enough money to live on their own in New York City. Apart from two characters, Chandler and Ross, all of the characters struggle to find a job and keep it. Monica aspires to be a chef, but for some time has to work at a tiny diner where she makes little money. Rachel has to learn how to be independent of her parents (something many Gen Y men and women go through). Phoebe, a free spirit who has been independent her whole life, still struggles with making enough money as a masseuse. And last, but not least, Joey, the aspiring actor who is not much of an actor. These characters prove that it is not easy to find your way in the real world, but they never give up and eventually get to the place where they are happy with their job and their life. Even though the economy is a rough place (it was booming in the 90’s), Gen Y men and women are also too determined to give up. We want to find the right job that makes us happy, and like the characters of Friends, we are well on our way. It just might take longer than we expected.